Want to be a better ally or advocate for transgender and non-binary individuals? Come join us for TTI’s Ally/Advocate Training Camp (ATC)! This class helps participants increase their transgender and non-binary-related knowledge and provides opportunities to practice the key skills needed by allies to be effective advocates. Whether you have a family member who has recently come out to you as transgender or non-binary, you want to better support a friend or loved one who is transitioning, are seeking to be a more effective ally in the workplace or you just want to be better informed, ATC will help build your knowledge and skills to be a better ally and advocate! ATC will be held in West Philadelphia, October 24-25, 2019, starting at 10 AM and going til 6 PM both days. The registration fee for this ATC includes lunch from local businesses on both days, snacks and beverages throughout the course, and access to the TTI Alumni private Facebook group upon completion of the course, and a contribution towards supporting those who are otherwise financially not able to attend. We want folks who want to attend ATC to be able to do so, regardless of economic constraints, while also making sure that we are operating in accordance with our values of paying our trainers fairly for their time, energy and lived experiences, while using sustainable business practices. (Please see our blog post here for a deeper dive into how we selected our sliding scale structure.) The full cost of attendance is $250 per person. 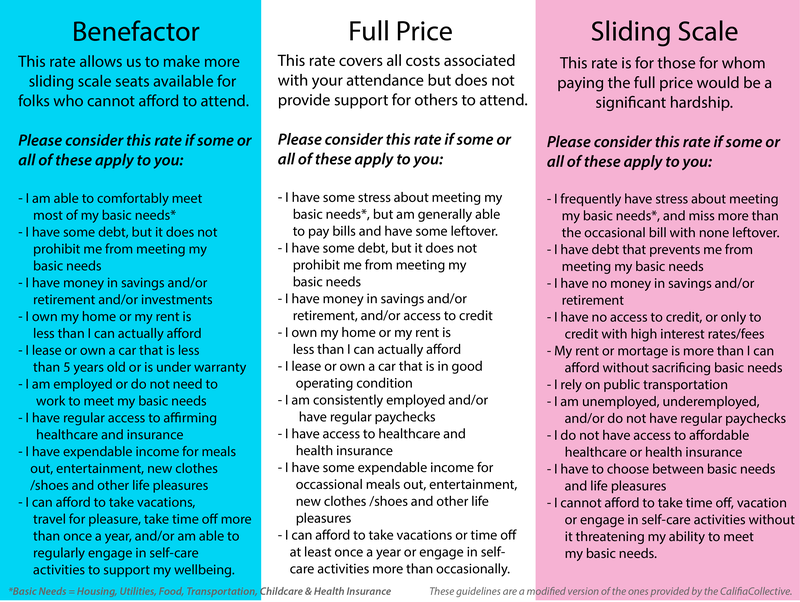 We set aside a certain number of Sliding Scale spaces, but when folks who can afford to pay more do (Benefactors), we are able to use the difference in price to make another sliding scale seat available to those in need at this or a future ATC. Please see our guide here before picking a payment level, or use our handy graphic to help determine your registration level.